Adam Gilbert, musicology, recorder and historical double reeds, is one of the premiere international players of the Renaissance shawm. Adam Gilbert, musicology, recorder and historical double reeds, is one of the premiere international players of the Renaissance shawm. He grew up in Columbia, South Carolina. The first graduate of the Early Music program at the Mannes College of Music in New York City, he has performed as a member of New York’s Ensemble for Early Music, the Waverly Consort and Piffaro, the Renaissance Band. He has appeared with ensembles such as Calliope, ARTEK, New York Cornet and Sackbut Ensemble, The Court Dance Company of New York, the Folger Consort, Concert Royal, The Bach Ensemble, Chatham Baroque, Newberry Consort, Canto (Colombia) and La Caccia Alta (Belgium) among others. He is also a founding member of ensemble Ciaramella, which performs concerts of fifteenth-century music in the U.S., Israel, and Belgium, and has recorded on the Naxos label. 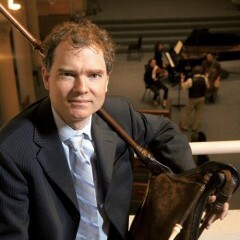 Gilbert studied recorder at Rotterdams Conservatorium and studied in Leuven, Belgium from 1998 to 2000 as a recipient of the Fulbright and Belgian American Education Foundation Grants working on his dissertation “Elaboration in Heinrich Isaac’s Three-Voice Mass Sections and Untexted Compositions.” He completed his PhD at Case Western Reserve University in 2003, and taught for two years as a visiting assistant professor at Stanford University. Gilbert can be heard on Dorian, Deutsche Grammophon’s Archiv, Passacaille, Musica Americana and Lyrichord labels. His research specialties include allusion in fifteenth-century song and Mass, pastourelles and their symbolism, improvisation, compositional processes and embellishment from 1400–1700. He lectures, gives master classes internationally and is an adjunct faculty of Tilburg Conservatorium in Holland. Member of Corporation and Selection Committee, B.A.E.F. Ciaramella, Music at the Crossroads of Renaissance Germany. Naxos (2005). Piffaro, Trionfo d’Amore e della Morte: Music for a Medici Procession. Dorian (2003). Piffaro, Music from the Odhecaton. XCD 90301, Dorian, (2002). Piffaro, Stadtpfeiffer: Music of Renaissance Germany. XCD-90292 Dorian (2001). “Renaissance Bagpipes,” for new edition of Performer’s Guide to Renaissance Music, ed. Jeffery Kite-Powell ( 2006). “Eight Brief Rules for Composing a Si placet Altus,” for new edition of Performer’s Guide to Renaissance Music, ed. Jeffery Kite-Powell (2006). “Some Rehearsal Tips and Ensemble Techniques for Early Music Ensemble Directors,” for new edition of Performer’s Guide to Renaissance Music, ed. Jeffery Kite-Powell (2006). Contributing editor, Harmonice Musices Odhecaton A: Quincentenary Performing Edition, ed. David Fallows (Shirley: Amherst Early Music, Inc., 2001). “The Bagpipe: Superexcellens omnia instrumenta,” in Performer’s Guide to Medieval Music, ed. Ross Duffin (Bloomington: Indiana University Press, 2000), 399-411.